Have you ever wondered why commercials sound louder than your favorite TV shows? Or why you have to adjust the playback volume on your television when switching between channels? The answer is that until recently, there was no standard way to measure the perceived loudness of sound recordings. Instead, audio productions were (and still are) normalized to peak levels, which do in no way determine how loud a signal is. In this article we will discuss the EBU recommendation R128, a new and open standard for balancing audio programs according to their actually perceived loudness. This recommendation marks one of the most fundamental changes in the history of audio in broadcasting and solves a major source of irritation for television and radio audience around the world: that of the jump in audio levels at the breaks within programmes, between programmes and between channels (from On the Way to Loudness Nirvana). Most big european broadcasting corporations are adapting their workflow to EBU R128 now, see e.g. The Loudness revolution comes to Germany and Austria. On the other side of the Atlantic, the same method has provided the basis for the implementation of the CALM Act in the U.S., which is called ATSC A/85. See also Too many loudness standards. Loudness perception is surprisingly complicated. The physical sound pressure level, which is usually specified in dB, tells us very little about how loud a sound will be perceived by a listener. For example, a low-frequency tone might appear much softer than a high-frequency tone, even if it has a higher sound pressure level. 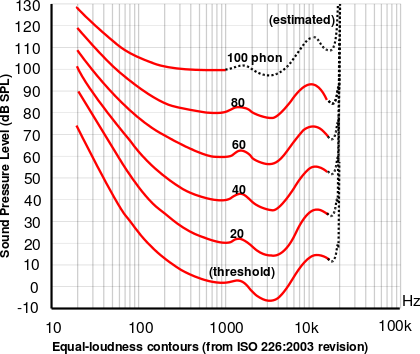 This frequency-dependency of loudness perception is described by the equal loudness contours. Figure from Wikipedia (with edits). As if this wasn't confusing enough, the frequency dependency of loudness perception itself varies with sound pressure level. Moreover, loudness perception is a highly subjective affair that depends on factors such as age and possible hearing damages. In short, loudness cannot be easily measured. Florian Camerer from the European Broadcasting Union argues that, "there's never gonna be such a thing as a perfect loudness meter." On the one hand, it is necessary to prevent clipping in digital audio. For this purpose, most broadcasting stations use QPPM (Quasi Peak Programme Meters) to measure quasi peak levels that, as we will see later, can actually lie below the 'true peaks'. These quasi peaks are then normalized to -9 dBFS (see p.2). But at the same time, peak normalization has been used as a method for maximizing the loudness of an audio program, despite the fact that peaks do in no way determine how loud a signal is perceived. The actual loudness of a peak-normalized program is therefore entirely unpredictable, which can cause annoying inconsistencies at transition points. Loudness inconsistencies due to peak normalization. Figure from On the way to Loudness nirvana—audio levelling with EBU R 128 (p.1). Because there was no loudness reference level, producers were worried that their productions would not appear as loud as everybody else's. In addition to peak normalization, they therefore used more and more dynamic range compressors and hard limiters to maximize the loudness (and thus allegedly the impact) of their programs. As a result of this Loudness War, the dynamic range of professional audio productions consistently shrank over recent decades—and with it arguably their expressivity. 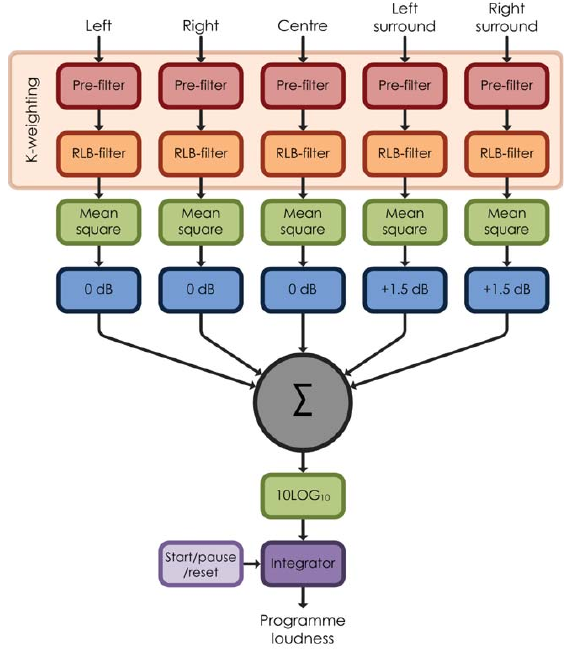 ITU-R BS.1770 algorithm (for 5.1 surround sound). Figure from On the way to Loudness nirvana—audio levelling with EBU R 128 (p.3). The K-weighting filter models the subjective perception of loudness and outperformed almost all complicated psychoacoustical models. Furthermore, ITU-R BS.1770-2 defines a gating method to just measure the loudness of foreground signals (e.g. speech) and ignore the low volume background sounds. The output of this algorithm is the program loudness, measured in Loudness Units (LU). Its absolute unit is referred to as LUFS (Loudness Units with reference to Full Scale), or sometimes also as LKFS. A step of 1 LU is equivalent to a step of 1 dB. The program loudness in LUFS specifies how loud a program is on average from its beginning to its end. In order to prevent clipping, the standard suggests a maximum true peak level of -1 dBFS for PCM, or lower levels for certain parts of the transmission chain (e.g., lossy or low-bitrate codecs, analogue re-broadcasters). ITU-R BS.1770 suggests to use an oversampling peak meter to measure the true peaks that can lie between samples and are often higher than the peaks shown by a QPPM or sample peak meter. 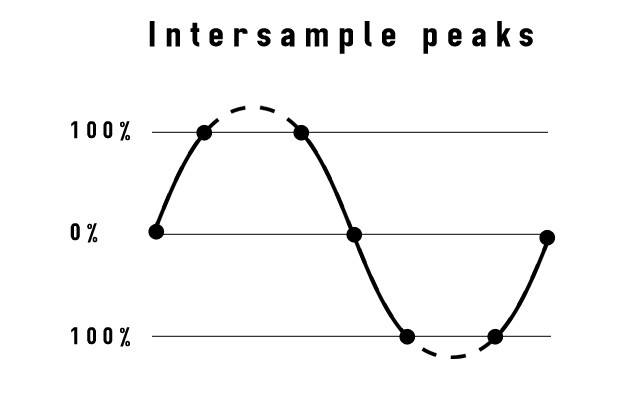 The 'true peaks' of a digital audio signal can lie between its samples. Figure from a blog by Morten Eriksen. 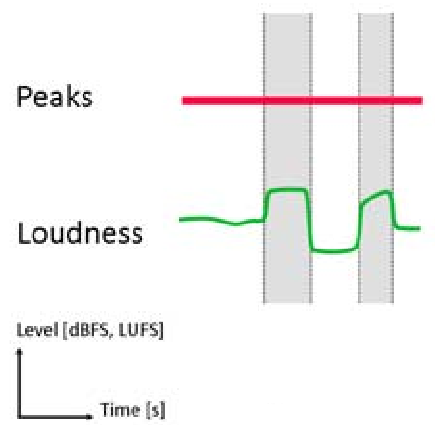 The loudness range (LRA) indicates the variation of loudness over the course of a program and is measured in LU. It can be used to determine whether a production requires dynamic treatment and how to adapt it to different distribution channels. For example, an audio signal with a large LRA might need to be compressed, and podcasts generally require a lower LRA than classical music recordings. 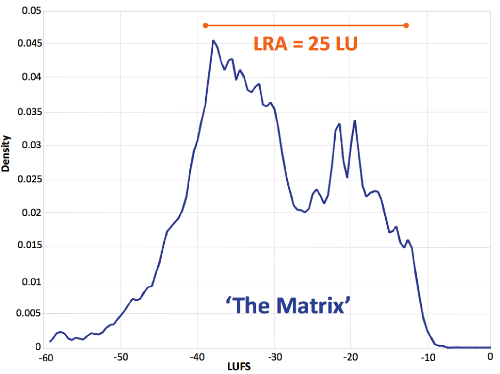 Loudness distribution and LRA for the film 'The Matrix'. Figure from EBU Tech Doc 3343 (p.13). The fight for "Who is the loudest" disappears, mixes can be more dynamic, there are fewer dynamic compression artefacts, such as "pumping", and thus there is an overall increase of audio quality! The EBU standard proposes -23 LUFS as the new center of the audio levelling universe (p.4), a meaningful target loudness that all audio content should be normalized to. However, Auphonic still uses a higher loudness target as default (EBU R128, ATSC A/85 and other common targets are selectable), which is discussed in Loudness Targets for Mobile Audio, Podcasts, Radio and TV. Loudness perception does not directly correspond to signal level. Peak normalization therefore results in unpredictable loudness levels. To counteract fears of not appearing as loud as everybody else, producers therefore got engaged in a Loudness War, in which most dynamics were lost to overcompression. Loudness normalization is concerned with balancing audio programs according to their actually perceived loudness. The ITU-R BS.1770 and EBU R128 standards provide an algorithm for quantifying the loudness and loudness range of a given audio program in loudness units (LU or LUFS). Broadcasting corporations and Auphonic are adapting their workflow to EBU R128 and ATSC A/85 now, to predictably balance the loudness of their programs. This counteracts the tendency to overcompress.